Hopefully your first few weeks of Summer have allowed for quality time outside. If you need some ideas to make your home the hot spot for barbecues, take these tips with you the next time you stop by Michaels. Spruce up the front steps or give your patio parties a bit of pizzazz with these DIY summertime projects. 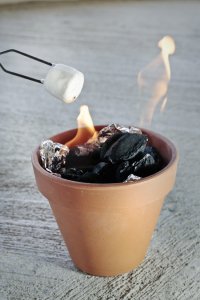 This miniature firepit is perfect for parties on the patio— or for toasting some ‘mallows. Either keep the mosquitos away or add some extra lighting to your nighttime endeavors! 1. Carefully and tightly wrap the 1/2” end of the Coupling with your Teflon Tape. You’ll want to keep each wrap nice and clean so that it creates a smooth, even surface. Continue building up the tape until it fits very snugly into the opening of your bottle. You obviously don’t want it to fall in. 2. Insert the Wick into the Coupling until it sticks out about 1/4”. The Tiki brand replacement wicks are about 3/8” in diameter so they fit really well. Once they absorb the torch oil they’re even tighter. 3. Unscrew the Split Ring Hanger on one side and position the bottleneck into the ring. 5. 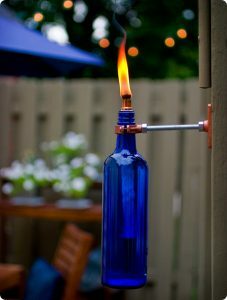 Use a funnel to fill the bottle with your favorite torch oil. 6. Insert the Coupling & Wick into the top of the bottle and twist it snugly into place. Give the Wick a few minutes to absorb the oil before you try to light it. 7. Use the Copper Cap to keep the Wick dry when you’re not using your torch. Add some extra seating, a pop of color, or storage to your backyard! 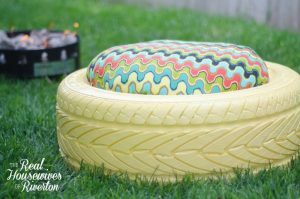 Paint your tire with the first coat, give it a FULL DAY to dry, and then add a second coat. Cut your wood circles that will be the base of your seat. You’ll need to measure the inside opening of the tire – you’ll want to measure so the wooden part sits on the inner lip. To create the pouff you’ll need stuffing. Gather some of the fabric up and begin stapling to the circle. Go about 1/3 the way around and then started stuffing the pouff. Have the pouff as fluffed and stuffed as you want and keep pulling the fabric nice and tight around the edge, stapling all the way around. Take fewer trips inside to raid the fridge with this summer life hack! 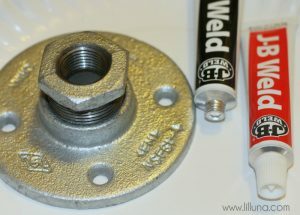 Use Original J-B Weld to glue this piece to the bottom center of the large bucket. 2. Use the connector piece to put in a large piece of pipe where the smaller buckets would hang off of. Let this dry overnight. 3. From there, connect all the pieces. 4. 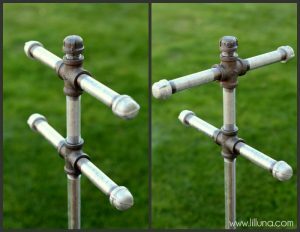 Add end caps and screw in the center pipe. 5. 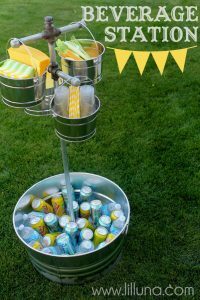 Fill the bucket with your summertime necessities (such as ice, soda, water, napkins, and cutlery!). 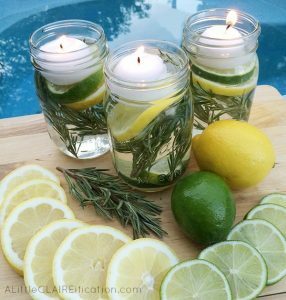 Keep the bugs away and add a fresh summertime scent to your front porch or backyard!